A mixed-use project would be built on the site of the live music venue the Viper Room on Sunset Boulevard in West Hollywood, California. Illustration: Morphosis Architects. The site of the Viper Room nightclub, popular for its celebrity owners, performers and visitors, may soon be known for another reason: a developer plans to build a D-shaped structure partially covered in greenery with a hole in the middle that’s unlike any other building on the famous Sunset Strip in West Hollywood, California. Developer Silver Creek Development Co. submitted a proposal to the City of West Hollywood that includes a 15-story building with a 115-room hotel and 31 market rate condominiums plus 10 affordable apartments, according to city records. The project would make space for a new iteration of the Viper Room with a 3,300 square-foot space on the ground floor that has an entrance on Sunset Boulevard, according to the proposal filed with the city. The club, which opened in the early 1990s at 8852 W. Sunset Blvd. , is now an unassuming single-story structure with stucco exterior walls painted solid black that is identifiable by small white letters on a black canopy over its front door. But the Viper Room, just blocks from other prominent Sunset Strip clubs such as the Roxy and Whiskey a Go Go, developed a dedicated following of Hollywood’s A-listers in its hey day, included actor Johnny Depp as an owner, and its stage has been graced by some of the music industry’s chart-topping talent, from Johnny Cash to the Pussycat Dolls. It’s also the site where actor River Phoenix died in 1993. Renderings of the proposed project show the D-shaped structure will be made out of two towers, one covered in greenery at the bottom of the opening in the middle. The development, which could total 240,000 square feet, calls for restaurants on the ground floor, a banquet hall on the second floor and a gym, spa and terraces, and at least one swimming pool, according to the application. The proposal is already getting mixed reviews from observers and residents. “It is great that they intend to keep a club and call it the Viper Room, but it is unlikely to have the same vibe as the original,” Elyse Eisenberg, chair of the West Hollywood Heights Neighborhood Association, said in an email, adding that she would prefer to see more creative office space on the Sunset Strip than another hotel. But others feel the project could also bring some much-needed amenities to the area. 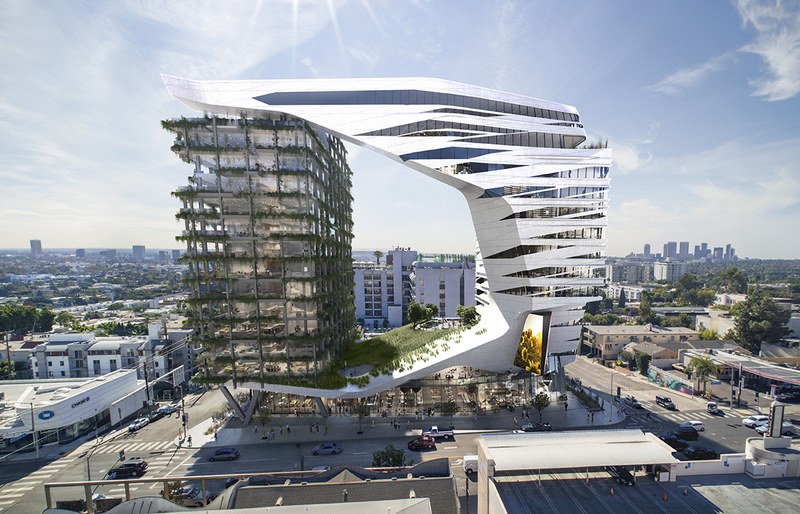 “If they could go up 15 stories and take advantage of the amazing views on Sunset Boulevard, I think a hotel on the Viper Room site would be fantastic,” said Bob Sonnenblick, principal at Brentwood-based Sonnenblick Development LLC, who is not involved in the deal. Sonnenblick said hotels in the area, popular with tourists, are doing very well. However, he cautioned that more development could increase traffic on Sunset which “is already bad,” he said. “Traffic up there is going to become horrible,” he said. “It will be probably with anything that is built up there,” and not just at this particular site. The project is now under an initial 30-day review after which the City of West Hollywood will hold a neighborhood meeting for those who live within 500 feet of the project site, according to John Keho, interim director of the planning department at the City of West Hollywood. The developer has requested to amend the Sunset Specific Plan, demolition permits, development permits and two conditional use permits to sell alcohol on site. “It’s going to be a long process,” Keho said. Beverly Hills-based real estate investor 5th Gear LLC sold the property , at 8852 Sunset Blvd. in West Hollywood, for $80 million last June to Scottsdale, Arizona-based real estate investor 8850 Sunset LLC, which is represented by Scottsdale, Arizona-based real estate investment company REM Finance Inc., according to CoStar data. It was sold as part of a four-property portfolio that includes 8850 to 8860 Sunset Blvd. The storefront building dates back to 1921, according to CoStar data. Current businesses on site, which include Aahs! The Ultimate Gift Store, Terner’s Liquor and Sun Bee Liquor and Deli, would be demolished for the proposed development. Morphosis, an architect in Culver City, California, is working on the project. West Hollywood-based real estate company Plus Development Group is the project manager, according to Mick Unwin, director at Plus Development.